IKEA is primarily known for their cheap minimalist furniture and home goods. Apparently this stark and organized aesthetic also translates to their foray into cookbooks, “Hembakat är Bäst” (Homemade is Best). 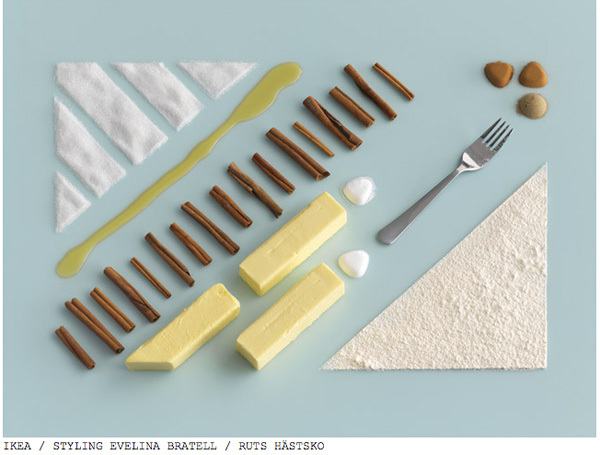 Not satisfied with mere lists of ingredients, the cookbook presents the ingredients as works of art in themselves, photographed by Carl Kleiner. Below is an image of the ingredients for Drommar, a type of Swedish cookie. NotCot has an extended post on these awesome images. And for those who can’t read Swedish, here is a recipe for Drommar.